If you are a dog lover, I recommend you see this video. Loyalty to her employer and a dog or the neighbor dog is not a secret anymore for us. A dog show solidarity to fellow dog friends who were injured by the tsunami in Japan (11/03/2011) which occurred some time ago. 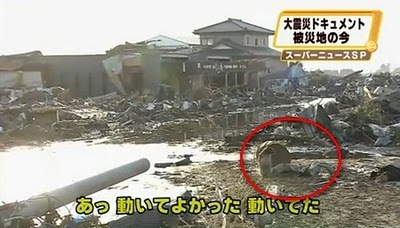 A dog when it was discovered by a television reporter at the location of the debris due to tsunami, the reporter tried to approach the tv and after it ran close to his friend who was lying because terlukan as telling the reporter as if to say "please help my friend who was injured this. "